HOUSTON  (June 16, 2009)  Sales of single-family homes for the greater Houston area achieved the highest volume of 2009 in May, and average and median home prices climbed to the highest levels since August 2008, showing signs of a real estate market that is benefiting from seasonal spring home buying. However, compared to one year earlier, overall May property sales were down 23.3 percent and sales of single-family homes dropped 21.2 percent, according to new monthly data compiled by the Houston Association of REALTORS® (HAR). At $157,450, the May single-family home median price  the figure at which half of the homes sold for more and half sold for less  rose 1.6 percent versus one year earlier. The average price of a single-family home in Houston edged up 0.3 percent last month to $213,474 compared to May 2008. Sales of foreclosure properties continued to shrink in May. Those properties, which typically sell below market prices, made up 19.9 percent of all single-family home sales in the Houston area. That compares to 34.0 percent in January, 28.0 percent in February, 24.5 percent in March and 23.6 percent in April. The median price of May foreclosure sales reported in the Multiple Listing Service (MLS) tumbled 5.3 percent from $89,900 to $85,108 on a year-over-year basis. Sales of all property types in Houston for May totaled 5,539, off 23.3 percent compared to May 2008. Total dollar volume for properties sold during the month was $1.1 billion versus $1.5 billion one year earlier, a 23.8 percent decline. Demand for rental properties eased slightly in May, with leases of single-family homes up 0.1 percent and leases of townhouses and condominiums up 6.2 percent on a year-over-year basis. This may be an indication that consumers are growing more inclined to purchase rather than lease homes, especially as interest ratesstill at historically low levelsbegin to rise. The month of May brought Houstons overall housing market mixed results when all listing categories are compared to May of 2008. Total property sales and total dollar volume fell on a year-over-year basis while average and median single-family home sales prices rose. The number of available properties, or active listings, at the end of May fell 15.1 percent from May 2008 to 45,282. That is just 13 more active listings than one month earlier, in April 2009, and continues to reflect balanced levels of housing inventory. Month-end pending salesthose listings expected to close within the next 30 daystotaled 3,637, which was 24.7 percent lower than last year and suggests another decline in sales when the June numbers are tallied. The months inventory of single-family homes for May came in at 6.2 months, down 5.4 percent from one year earlier. The national months inventory of single-family homes rose slightly to 10.2 months, according to the National Association of REALTORS® (NAR). At $213,474, the average sales price for single-family homes rose 0.3 percent from May 2008, when it was $212,872. The figure is at its highest level since last August. The median price of single-family homes in April was $157,450, up 1.6 percent from one year earlier. The national single-family median price reported by NAR is $169,800, illustrating the continued higher value and lower cost of living that the Houston market offers consumers. May sales of single-family homes in Houston totaled 4,797, down 21.2 percent from May 2008, and accounted for the 21st consecutive monthly drop. However, that volume is the highest so far for 2009. Year-over-year sales of single-family homes priced at $80,000 and below declined 12.3 percent in May, reflecting tapering foreclosure-related transactions. HAR also reports existing home statistics for the single-family home segment of the real estate market. In May 2009, existing single-family home sales totaled 4,019, a 21.4 percent decrease from May 2008. At $196,866, the average sales price for existing homes in the Houston area rose 0.5 percent compared to last year. The median sales price of $147,400 for the month was up 1.6 percent from one year earlier. The number of townhouses and condominiums sold in May fell compared to one year earlier. In the greater Houston area, 399 units were sold last month versus 618 properties in May 2008, translating to a 35.4 percent decrease in year-over-year sales. However, that still represents the highest sales volume for all of 2009. The average price of a townhouse/condominium fell to $156,907, down 11.1 percent from one year earlier. 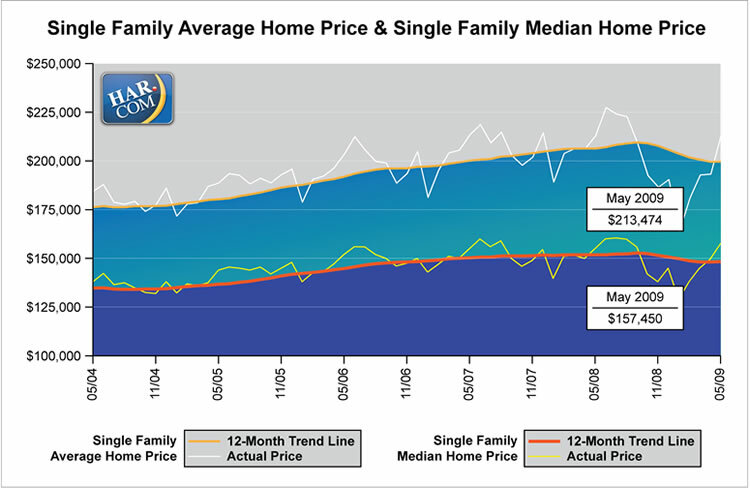 The median price declined 18.7 percent to $125,950 from May 2008 to May 2009. Demand for single-family rentals eased in May, and may suggest that conditionsparticularly for first-time homebuyershave improved to the point where consumers are ready to purchase. Single-family home rentals rose 0.1 percent last month compared to a year earlier. Year-over-year townhouse/condominium rentals rose 6.2 percent. Active listings fell 15.1 percent, representing a generally balanced supply of housing inventory.